I bought this bike and it was just a box of rusty nuts and bolts. 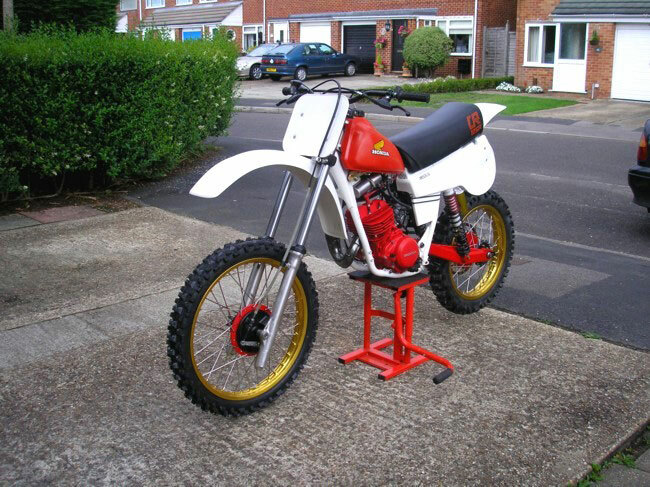 I raced a 1979 CR125R model back in '79 and always wanted to do a restoration. Having spent most of my younger life racing Honda CR's this seemed like the best model to restore. Every nut and bolt on the frame, seat, airbox, motor topend, inlet boot, triple clamps, etc are new Honda item's. All wheel bearings, swingarm bearings, and headstock bearings are new, as are all the seals including the rear brake lever pivot bushes and seals and brake cam's seals. New seat foam and cover, new std piston and new sleeve were used. Wheels were rebuilt with new rim's and SS spokes. The stock header pipe was stripped of paint and painted using heat proofed lacquer, Everything that had paint on it was repainted including frame, triple clamps, brake backplates, footpegs, motor etc. The only thing I've not touched is the motor's bottom end as I was assured that it had just been rebuilt. The Ohlin shocks were rebuilt, and forks overhauled. That's pretty much it. Nothing has been left to chance. As you can see the colour scheme is a very personal scheme. I used colours from that period (Mugen white, DG gold and Honda red). All mechanical and paint work was done by myself, except the wheel lacing and the re-sleeving of the cylinder.